In different ages we want different things, this is normal. However, no matter how old you are, whatever you have affinity, San Sebastian will need all the wishes and desires fulfilled. It is a destination that truly has it all and a lot has to offer. Once upon a time was a favorite resort of General Franco. During the First World War found refuge here are members of the Russian imperial Romanov family, as well as Leon Trotsky, composer Maurice Ravel, spy Mata Hari and many other members of the jet set of the time. Now, during the film festival, by visiting Hollywood movie stars. I explored the length and breadth of Spain, I can talk about it for days . I know her better than Serbia. I love the magic of Andalusia, Catalonia and adore her insane architecture, Royal Madrid, Zaragoza and the Aragon region, a charming Galicia … However, the diamond in the rough for me is still – Basque region. 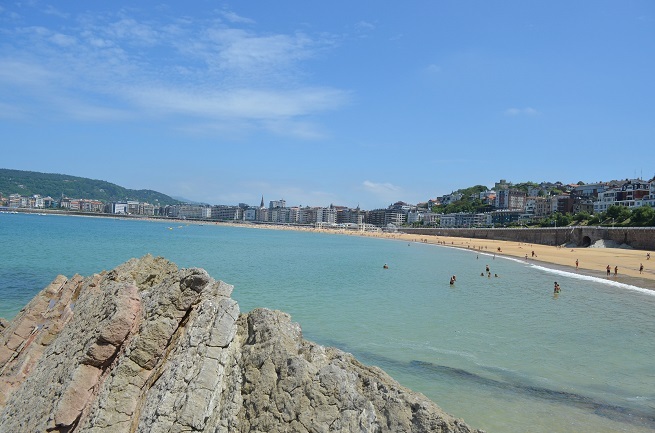 In the north of Spain, on the border with France, surrounded by mountains Igeldo, Urgull and Uliaj and on the other side of the Atlantic Ocean, is the San Sebastian. Basque name of the town is Donostia. It is situated on the river Urumea, a combination of traditional and modern, as well as the whole Basque region, all in green. If you visit in summer, you will have the opportunity to make sure that life takes place on the beaches of Ondara and La Concha (shell). Immaculately maintained them, beautiful beach of fine golden-yellow sand stretches the entire length of the bay. Across the river is the third Zuriola beach, known for its large waves ideal for surfing and windsurfing. On the island of Santa Clara, which is located across the bay at low tide create a beautiful beach. Until it can be reached by boat or by swimming like the locals do. The size and surface area beaches very dependent on the tides, so wonderful sandy beach where you enjoy during the day, in the afternoon for a short time can disappear. If you visit the city in winter, will welcome you with waves several meters high. Then you should watch the scene from a distance, since it is not at all safe to approach him. Along the beach is a promenade, parks, beautiful villas, but an experience to walk in and out of season when the tourists go home. In the middle of the bay at hill above the tunnel in the park of the Palace of Miramar. Once a royal residence of Queen Maria Cristina. At the end of the bay is Mount Igueldo. Below him, at the end of the beach Ondara, sculptures Combs wind (El Peine del Viento) famous artist Eduardo Chilida, which is heavy metal structures installed in the wall right next to the sea, and the waves relentlessly engulfing. One of the symbols of the city. At the top of the hill you can walk or an old cable car. From there, the terrace is the best view of the city and bay. At the other end of the bay is hill Urgul. Until it can be a twenty minute easy walk through the woods from the old town. Before the evening is the perfect time to visit because you can enjoy the magical sunset over the bay. There are a small fort and a castle, a chapel and cannons from where they used to defend the city. However, the space at the top dominates twelve meters high statue of Jesus was built in 1950. 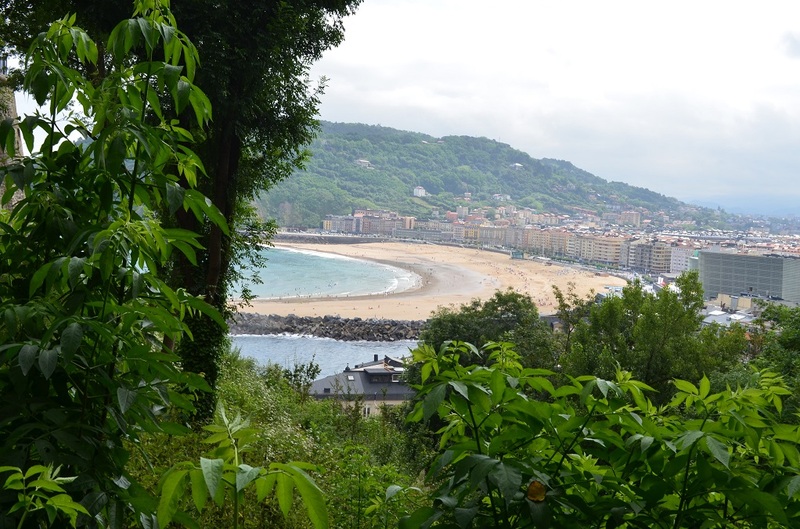 Below the hill there is an old port Donostia, which daily hosts numerous boats and yachts. Around the hill is made promenade El Paseo Nuovo, that Port arrives at the coast of the river to the other side of the old part of the city. Below the hill Urgull housed the old town with narrow streets, which is particularly noisy in the evening when many tourists rush to restaurants, which are all over the place. Here are per square meter is the highest restaurant with Michelin star. Pincho is the brand and pride of the city. 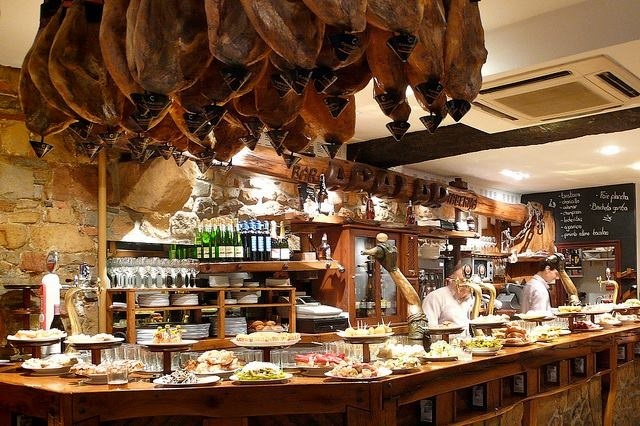 This is the Basque version of tapas and each cafe’s sure to serve at the bar. 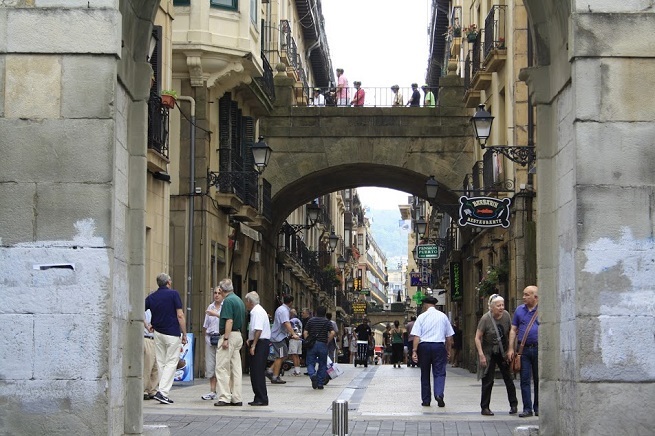 The charming old part of San Sebastian is known for the highest concentration of bars in the world. Enjoying food that is offered here is a paradise for the soul and body. Be sure to find the net of the bars to visit. Basque region and the entire northern area of ​​Spain, thereby San Sebastian, it is better developed and more expensive compared to the south. The old part of town Parte Vieja is not large, and until 1863 it was surrounded by walls. Part of the walls can be seen today near the airport, where he survived, where there are gates Portaletas. Downtown is considered the market Constitución, with medieval buildings and balconies from which they watched bullfights. In the past, it maintained the coronation and raise the uprisings. Nearby is the beautiful baroque church from the 18th century and the building of the Dominican monastery from the 16th century in the Gothic style in which today is a museum of San Telmo. At the site of the former city wall was built in the boulevard with many shops and a large pedestrian zone. Boulevard Zumardia starts building City Hall on the coast. It was built in 1882 and originally was a casino, but in front of the building there is a beautiful park. It is obligatory to visit the market and the “Victoria Eugenia” teat, and the building Kursal which is located along the beach Zuriola. During the day, the building looks like a boring modern building, however, is illuminated at night and looks like a huge illuminated billboard and totally changed. The city is definitely the most beautiful flying visit during the summer festival Semana Grande, which takes place in August. Then the city streets and squares of concerts of traditional music, and the evening ends with fireworks. Flights are usually organized many festivals and outdoor concerts. In September, the San Sebastian is held international film festival which is among the most famous in the world and it is visited. In January the local population Tamborada most important festival, known as the Day of San Sebastian. 24 hours continuously You will hear the drums. 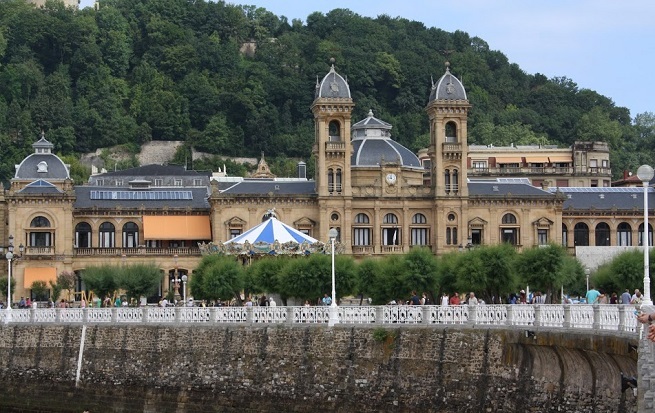 San Sebastian is now the European Capital of Culture. I must to mention that football and the football club Real Sociedad important issue in people’s lives here. The position is very good. As I have already mentioned, is located on the border with France, and in no time you can run down to good wine and cheese in the neighborhood. At some 100 km is located in Bilbao, a beautiful city that has the privilege to be part of it one of the Guggenheim Museum. Also, nearby is Pamplona, ​​the town in which you can run with the bulls. 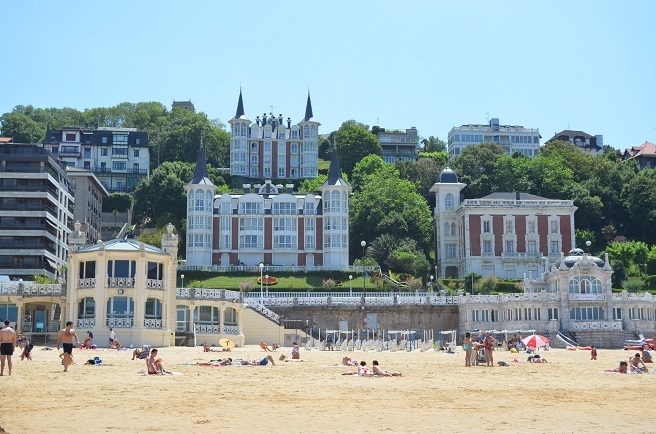 Although one of the smaller cities in San Sebastian live 186,000 inhabitants and is very well connected with the rest of Spain and Europe. The smaller airport is located close to the city, is greater in Bilbao. Rail and road transport are excellent. I hope that you clear the situation and give you the answer asserted. Espero que os haya convencido de que vamos a cumplir en San Sebastián! Adiós.